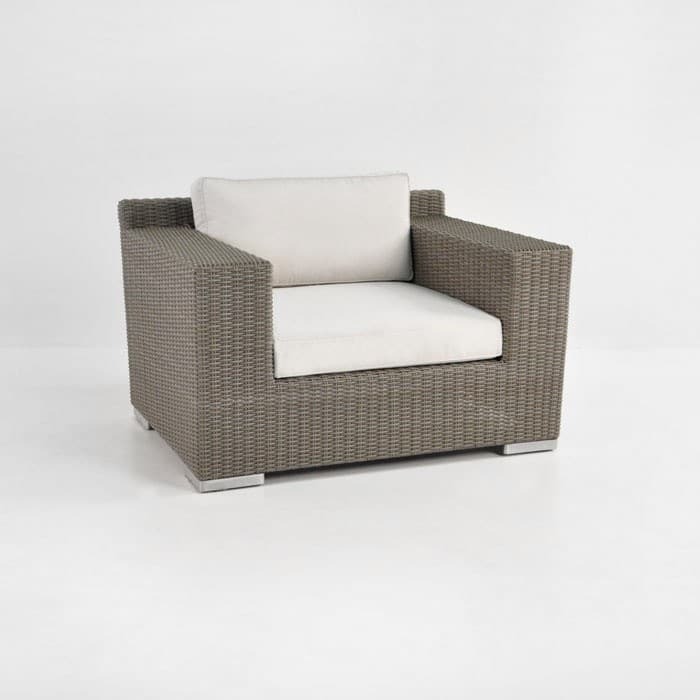 The Henry Wicker Outdoor Furniture Collection: Stately, dignified, and abundantly comfortable! A particularly handsome set; the Henry Wicker Outdoor Furniture Collection is deep, rich and luxurious. The presentation is big and bold: Strong lines and larger pieces create a grand effect which you will be content to sink into. Each piece has straight horizontal or vertical lines and a slightly taller back than the arms; to assist in comfort, so you can put your head back and enjoy those afternoon snoozes! The Collection is made up of 3 key pieces: the Henry 3 Seater, Henry 2 Seater and the Henry Club Chair. Available in the beautiful ‘Kubu’ shade of Viro® wicker and cushioned with Canvas Sunbrella® and Quick Dry foam you will love the chic attitude of this simple set, and be glad to know your products are of the highest quality for outdoor use! Mirror the Henry 2 Seater with two Henry Club Chairs and place the Henry 3 Seater in between for an open plan ‘C’ shaped seating set! You can mix’n’match with our teak pieces as well! Add a couple of ‘C’ Tables to accentuate a modern look. The Henry Wicker Outdoor Furniture Collection comes with FREE Sunbrella® cushions!